The queens are together again. While Nicki Minaj's album Queen has been delayed until August, it looks like we will be hearing some new music from her before that. Ariana Grande posted a short video of a new song from her and Minaj to Twitter. The clip is only 21 seconds long, but in it, both Grande and Minaj can be heard. The is not the first time the ladies have teamed up on a song. They teamed up for both "Bang Bang" and "Side To Side" in the past. Ariana Grande recently released the song "No Tears Left To Cry," which she performed at the Billboard Music Awards. 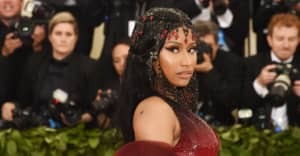 Nicki Minaj has released two singles "Chun-Li" and "Barbie Tingz." She also recently featured on YG's "Big Bank." Watch the clip of their upcoming track below.